Summertime is upon us! As school rolls to a close and warm weather and freedom are bestowed upon our families, it’s time to have some fun! One way to capture the magic of this season and encourage creativity in our children all summer long is to lead them in the ongoing project of keeping a journal. Journaling has many benefits. The simple act of keeping a record of your days is an enlightening gift for your future self. Practicing self expression and self reflection lead to greater self awareness. What’s more, the habits of consistency and diligence are valuable to develop for life. A journal is a fun way to encourage responsibility. Choose a time of day that the journal will be written in and maintain that all summer for your family. Bring journals on vacations and day trips. Let the journal be the anchor for your family memories. An enjoyable way to kick off this summer-long endeavor is to have your children decorate their own journal. Craft items like colored duct tape, paints and markers, stickers, photos, stencils, and so on. will allow them to turn a simple notebook into a personalized treasure. Summer is about freedom. A summer journal can reflect that by allowing for all forms of expression within. Whether your child wishes to doodle, paste photos, write a poem, jot down the lyrics to a favorite song, or write a traditional journal entry, allow their creativity to flourish in their journal. Keep craft supplies close at hand all summer and encourage your children to make their journal what they want. Remind them they are creating a keepsake they’ll treasure forever. 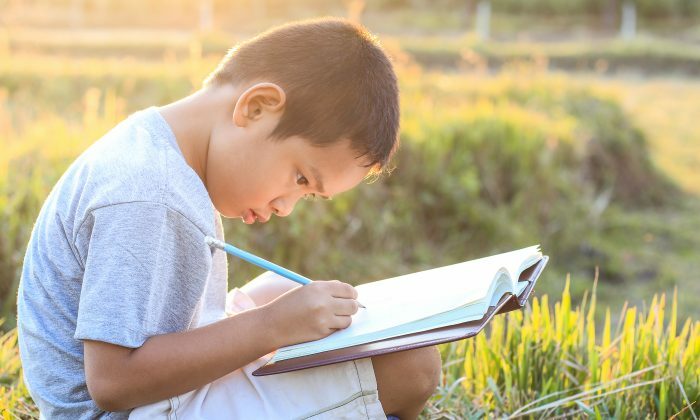 Educators know that a summer where reading and writing habits diminish can lead to a “slide” in aptitude, requiring some catching up each school year. A journal is one way to diminish these effects. By providing a tool that regularly encourages the use of such skills, children unwittingly have fun with language arts and may even improve in this regard before the next school year begins. Pausing to reflect on the day, especially with a thought of gratitude in mind, can help children to foster a sense of gratitude in their lives. Gratitude can lead to a generally positive outlook on life. Encourage this idea repeatedly. You’ll likely find Mom and Dad will benefit, too! Sharing stories of each day, looking back on happy memories, sorting out and expressing emotions, and working together on a common project are all ways a summer journal can strengthen family bonds. Parents may choose to join in, keeping their own journal they decorate and share with their children all season, which any child would delight in! The end result will be a handmade record of an entire season of childhood. This will become a treasure for your child’s entire life. With consistent maintenance and care, lessons in long-term diligence will be clear at the end of the summer. Your may have even established a habit they maintain all their lives.